Even though the Samsung Galaxy S3 hasn’t run its course, there are rumors and wishlists cropping up around the internet of the Samsung Galaxy S4 already. While the S3 still ranks in the top three best phones on the market right now, with thousands of different opinions on what phone takes the top spot, it may be true that Samsung are already working on the Galaxy S4, to keep their phone at the top. The Samsung Galaxy S3 has recently outmatched the iPhone 4S on sales and we believe this trend will not continue with the Galaxy S4, simply because of the huge volume of sales the iPhone 5 has already captured. Still, Samsung do have a chance to really broaden what the two companies offer – while the Samsung Galaxy S2 was a lot like the iPhone, the S3 moved away from that and the design really reflected the start of a new process in Samsung’s workplace, one not barred by trying to be Apple. One of the major rumors is on the screen, many are saying Samsung may make it the size of the Samsung Note, but we believe they will stick around where they have it now and may downgrade to 4.5-inches. According to pressblue, the Galaxy S4 may have a five inch screen that has 440ppi, 110 pixels-per-inch better than the iPhone 5 with retina display. This will be full 1080p HD. Some reports say that Samsung will continue to use quad-core processors, although they haven’t specified what kind. ARMx8 architecture won’t be around for another year or so, we doubt Samsung will have this harnessed into the Galaxy S4 that quick. We believe that the GHz needs to be pushed a little further than we’ve seen, many phones clock at 1.2GHz and the fastest we’ve seen is 1.7GHz – most computers nowadays have 3.0GHz, we should see Samsung push the boundaries with the Galaxy S4. 2GB’s of RAM seems an adamant amount. We are unsure if Samsung will look to add too much RAM, but it all depends on if the other components match. Flexible screen technology may allow Samsung to create the Galaxy S4 bezel-free and this will impact greatly on the size. A report on the design of the Samsung Galaxy S4 said that Samsung would be making a rubbery back that allows the user to have a tight grip of the phone. 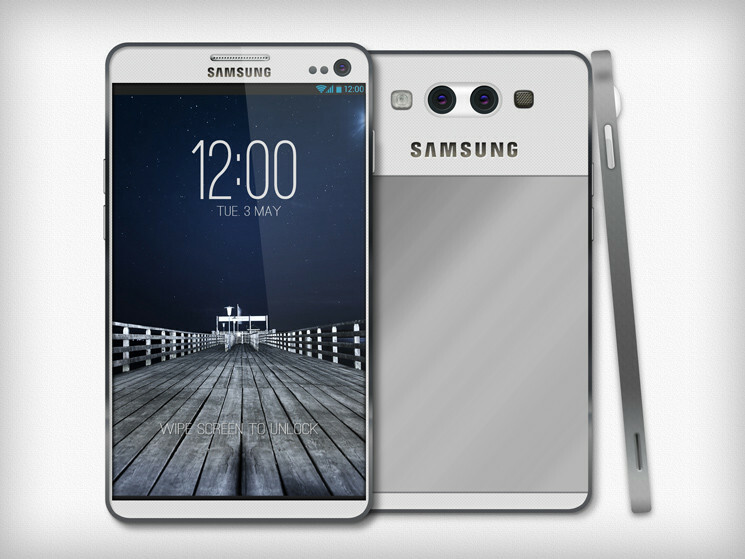 We would love to see this, as the previous Galaxy phones have had that rather cheap plastic feel.